News article of August 2, 2010 in the Capital Journal by Emily Wickstrom reported a major discovery by Brent Saucerman. 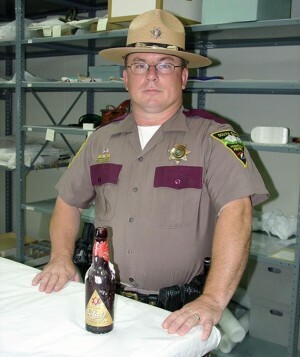 PIERRE, SD — My first cousin, State trooper Brent Saucermen of Capital Protective Services discovered a beer bottle beneath a floor vent in the House of Representatives. Saucerman was checking for possible lost articles during one of his sweeps. It was a 1906 Blatz. Just in time for the South Dakota Centennial. Whether the bottle is museum quality is debatable. Time capsule mystery? Will the descendents of this artifact step forward to claim it? Brent Saucerman is the second son of Calvin and Patricia Saucerman. After graduating from Midland High School, Brent joined the Navy and spent months under the high seas on nuclear submarines. His family are proud ranchers descended from the first Homesteaders who settled South Dakota west of the Missouri River. Trooper Saucerman has been referenced in other internet postings as a welcoming figure of the State Capitol Building.